RIVERSIDE, CA 2/15/11 – It was another successful week for Walker Evans Racing at the 2011 King Of The Hammers event held in Johnson Valley, CA. Thousands of spectators, teams, and vendors as well as hundreds of would be competitors filled Means Dry Lake Bed all looking for their chance to be crowned the 2011 King Of The Hammers. Only 100 racers would qualify for the big show held last Friday and a fraction would finish this grueling off road race event. Shannon Campbell in his Monster Energy / Campbell Enterprises single seat rock buggy would prove to be the King coming from a mid pack starting position to win the race while running on Walker Evans Wheels and Goodyear Tires. Walker Evans Racing is proud of Shannon Campbell and his accomplishment this year. 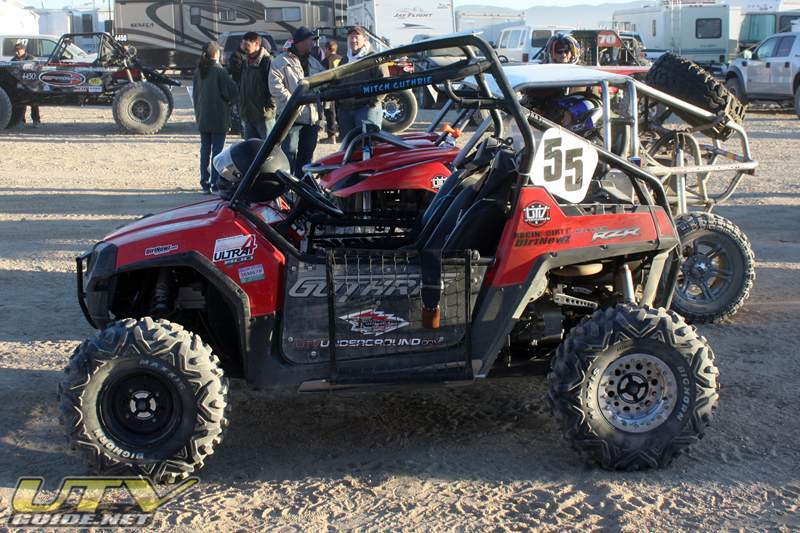 Few are as dedicated to the sport of off road rock racing as Campbell is and it was a pleasure to see his efforts pay off in a big way taking home a $15,000.00 check from Hammer King Productions and the title of King Of The Hammers for 2011. Tony Pellegrino in his GenRight Off Road machine also started way down the line but managed to pull off a stunning 2nd place finish making a pass in the closing miles of the race. Despite many challenges during the race Tony and his entire team did a fantastic job of preparing and the results proved that. Tony was also running Walker Evans Wheels wrapped with Goodyear Tires, a combination that proved to be durable enough to withstand The Hammers and claim the top 2 spots atop the podium! Rounding out the top 10 for Walker Evans Racing was Gary Feravanti who finished 7th and Les Figueroa who finished 9th in the hammers race. Both racers also ran the Walker Evans Racing Wheels and Goodyear Tires combination. We can’t express how proud we are off all of our supported teams and racers who competed in this grueling event and came away with not only a finish but a top 10! In the UTV King Of The Hammers race held last Thursday the defending back to back champion Mitch Guthrie came up just a little short on his quest for a 3rd consecutive title in the UTV class. Guthrie running our Walker Evans Racing long travel UTV Shocks finished just behind the leader for a solid 2nd place finish. We are proud to support Mitch in his UTV racing efforts and expect to see him back on top again next year! Walker Evans Racing builds products based around the most rigorous research and development tests and uses events like King Of The Hammers and Baja Racing to prove the durability and strength of our products. Events like these only further our quest for developing the most durable off road related products in the industry. Whether it is our popular Walker Evans Racing Wheels or Shocks you can rest easy knowing that you have the best products for the most extreme situations supporting whatever machine it is you drive.